Advil, an over-the-counter medication, is a brand name version of ibuprofen, a nonsteroidal anti-inflammatory drug (NSAID) that is used for the treatment of mild aches and pain. Each adult strength tablet of Advil contains 200 mg of ibuprofen. Ibuprofen also comes in a generic form and is the main ingredient in another brand, Motrin. Advil is used for a variety of common ailments. You can use it for pain relief, to reduce inflammation, and to lower your temperature if you have a fever. Advil generally starts working within about 15 minutes and typically continues to work for four to eight hours. Keep in mind that Advil used for temporary symptomatic relief, meaning that it does not cure any illness or medical condition. When taking Advil, you should use the smallest effective dose to minimize the potential for side effects. Your doctor will help you determine the right dose. Adults and children 12 years old and over can take up to two tablets of Advil every 4 to 6 hours. You should not exceed 6 tablets in 24 hours or take Advil for more than 10 days unless directed to do so by your doctor. Adult strength Advil comes in 200 mg coated tablets, 200 mg film-coated rapid release tablets, and 200 mg liqui-gels. 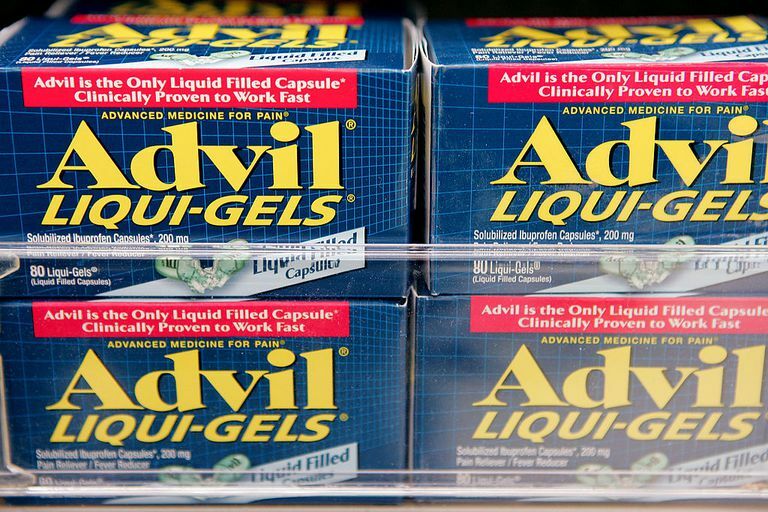 Advil Liqui-gels are a fast-acting formulation which contains solubilized ibuprofen that has been dissolved in a liquid center of a soft capsule. While regular strength Advil is recommended for adult use, there are children's forms, which include Junior Strength Advil Chewables, Junior Strength Advil Tablets, Infant Advil Drops, and Children's Advil Suspension. For children, the recommended dose of Advil is based on weight. Special measuring cups or spoons, as well as guidelines for measuring your child's dose, are contained with each package. Advil works through several biochemical mechanisms, some of which are related to the inhibition of cyclooxygenase (COX), an enzyme that helps in the production of prostaglandins and thromboxane. Prostaglandins are involved in mediating pain and fevers, thromboxane is involved in promoting blood clots, and COX also helps maintain a protective layer of the stomach lining. Advil's therapeutic effects of reducing pain and lowering fever are based on the reduced action of prostaglandins. Advil's side effects are related to its inhibition of COX and thromboxane. Advil can cause side effects, but it is important to know that the side effects, risks, and contraindications of Advil are the same as those of other brands of ibuprofen and very similar to those of other NSAIDs. Advil and other NSAIDs can cause stomach upset, and you can reduce the chances of developing an upset stomach if you take it with food or milk. Advil can also cause bleeding, which most often manifests with stomach bleeding. It's important to be aware of the symptoms of stomach bleeding, which include dark stools, fatigue, dizziness, and feeling cold. Advil can also cause easy bruising, prolonged bleeding from a cut, blood in the urine, and bleeding into the eye. Advil rarely causes allergies, producing symptoms of hives, facial swelling, asthma, skin rash, blisters, or shock. Advil can increase your risk of heart attack or stroke. The risk increases with higher dosages or prolonged use of Advil. Aspirin, another NSAID, does not increase this risk—in fact, it is often used to reduce the risk of strokes and heart attacks. You should not take Advil just before or after having heart bypass surgery. Also, unless otherwise directed, pregnant women should not take Advil during their last trimester. Advil is one of the most commonly used over-the-counter medications. It is typically very safe, but there are risks. Be sure to follow directions and not to take more than the recommended dose. If you have persistent pain or fever, or symptoms that do not improve with Advil, be sure to see your doctor, as your symptoms could be the sign of an underlying condition that requires a medical evaluation. Bastaki SMA, Padol IT, Amir N, Hunt RH. Effect of Aspirin and ibuprofen either alone or in combination on gastric mucosa and bleeding time and on serum prostaglandin E2 and thromboxane A2 levels in the anaesthetized rats in vivo. Mol Cell Biochem. 2018 Jan;438(1-2):25-34. doi: 10.1007/s11010-017-3110-1. Epub 2017 Aug 1. Zampronio AR, Soares DM, Souza GE Central mediators involved in the febrile response: effects of antipyretic drugs. Temperature (Austin). 2015 Oct 13;2(4):506-21. doi: 10.1080/23328940.2015.1102802. eCollection 2015 Oct-Dec.
What's the Difference Between Advil and Aleve? Should You Fear Potential Side Effects With TNF Blockers?